happy st. patrick's day! i'm not irish, and i don't really celebrate st. patrick's day, but i do enjoy homemade irish soda bread once per year. in the past, i've shared recipes for cast-iron skillet irish soda bread and irish soda bread scones. 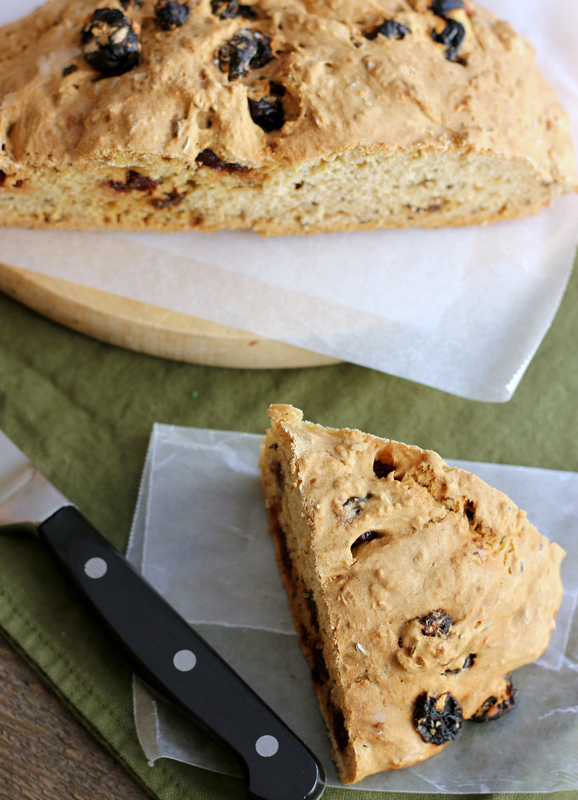 this year, i wanted to try something different and try my hand at vegan irish soda bread. it turns out it's super simple to make this well-known treat vegan, and it is super delicious. i only had a little bit of raisins left in the pantry, so i added in some dried cherries (which i know is not traditional at all) and they were really great. i love it served warm with a cup of tea. preheat your oven to 425 degrees F. combine the milk and the vinegar and set aside for 5 minutes. in a large bowl, stir together the flour, baking soda, salt, sugar, raisins, cherries, and caraway seeds. pour in the milk mixture and stir with a wooden spoon just until incorporated and a dough forms. pour the dough out onto a lightly floured surface and kneed a few times into a ball. place dough in a greased cast-iron skillet and cut an "x" in the top of the dough with a serrated knife. bake for 45 minutes until the crust is golden brown and a toothpick inserted into the center comes out clean. once baked, allow the bread to set in the skillet for 10 minutes before cutting. serve warm.